I’m Shell Little, you can find me on Twitter @ShellELittle. I work for Wells Fargo DS4B on the AUx team for WF Wholesale. I am the NVDA subject matter expert. I am a Crazy Cat Lady. Ask me about my Switch! And I'm excited to be here! Neurodivergent (ND), means having a brain that functions in ways that diverge significantly from the dominant societal standards of “normal.” Coined by Kassiane Asasumasu, a multiply neurodivergent neurodiversity activist. Does not mean Autistic, rather it’s a broad scope of different Cognitive Disabilities including: ADHD, Autism, Dyslexia, Bipolar. Because it takes the negative connotation away from those whose minds work differently. It does't mean things like Broken, Sick, Defective. Why do we force WCAG Criterion number memorization? Some A11y Specialists feel if you don't have the number of a WCAG Criterion memorized you aren't a credible Accessibility SME. For someone with Dyslexia or Dyscalculia that type of memorization is a barrier. This old mentality is riddled with ableism and needs to stop. Why are there not more WCAG Criterion for CogDis? Why do we really only have Pause, Stop, Hide and Three flashes at the AA level? When in reality we have uses who are ND that use ALL of these types of AT Including Screen Reader, Captions, Voice to Text, and A11y Fonts. Dyslexia and Dyscalculia: -Spell Checker. If you don't have spell checker working on a text input field of any kind, that's a barrier. -Voice to Text. With dyslexia sometimes a word just isn't going to happen. You can't guess the spelling of every word and have spell check be helpful. This is where voice to text comes in, and can be the AT needed to finish a task. -Copy and Paste. When working with difficult strings of text being able to paste them in becomes critical. -Screen Readers. Screen Readers are a powerful tool for people with dyslexia. Having the information given in more than one way helps to increase comprehension. ADHD and ADD -Read Only Mode is AT for someone with attention related disabilities. Being able to block off distracting graphics and moving objects is very important. -Ad Blocker. Being able to block distracting pop up ads, JS overlay ads, and any type of invasive alert is crucial for completing a task. -Auto-complete. When working with small working memory, not needing to remember passwords is a huge thing. -Captions. Well written captions (not Craptions) are important to people with a variety of Language Processing disabilities. They also help keep focus on the main content of media and away from distracting background sounds. A Tweet from @cassolotl that reads "Definitely. I basically can't process a page if there are animated or otherwise distracting ads, because autism!" Screen shot of The Seattle Times website with an overlay that reads "We noticed you're blocking ads". This overlay shows up when using ad blocker to try and cut down on moving content. What you're saying to your users when you tell them they can't block their distracting ads: The screen shot of the overlay now reads "We care more about our revenue than your access". You are basically telling users who are ND they aren't welcome on your site. In order to block moving ads you're requiring them to pay a fee. This is often times referred to a "disability tax". If we had more of a conversation around moving ads, the companies that supply these ads including Google and Yahoo would have to think about the kinds of ads they send out to users. We could change this in a day if enough people spoke about it and raised concerns. A Tweet from @transyurochka that reads "@netflix stop making your subtitles paraphrasing. It should be EXACTLY what is being said on screen. I am a hearing person that has language processing disorder sometimes I need subtitles. It is extremely confusing when the subtitles and speech don’t match up and deaf/hoh people should be able to read what hearing people hear in a show/movie not what you decide they should read"
As an example, Netflix's Queer eye had subtitles that were paraphrased. A screen shot of the show is displayed and Jonathan Van Ness's captions read "except for one that didn't get canceled". A tweet from @alley_mason_as says "a short example, what @jvn says is “except for one that didn’t get canceled and break everyone’s heart.” Netflix only captioned half of that, for no real reason at all. It’s more than just bleeping profanity, it’s almost every single line in this show.He deserves his whole line!" Tweet from @utterb1iss that reads "Whenever i get too stressed my dyslexia gets a million times worse and basically keeps me from doing anything that doesn't have voice-to-text 😭"
A screen shot of the Pinterest Application on their "Search" page. A red circle notes that the place above the keyboard where the "Microphone" icon used for Voice-to-text is not available. This is a huge barrier for someone with dyslexia trying to search for something on Pinterest. Google Doc has a feature where you can type on a paper with Voice-to-Text. Try it out! A Tweet from @markwwilsonmd that reads "You know what's a super fun example of ADHD, half the time I start typing in my password into my practice software, I start daydreaming 2 nanoseconds in and can't convince myself I typed it in correctly (and it's x'd out so I can't see) and I have to retype it. Feels awesome." On the Anthem Blue Cross website their password field has the "eye" icon that can be selected to display the password or not. This is helpful for ND people in order to be sure they typed in their password correctly. A Tweet from @HipsterTaiga that reads "I have ADHD and Tourette's bro I reset my gmail password every 4 days because I can't ever remember what it is"
There are many applications that help users store their passwords. One such app is "LastPass"
All of my passwords are currently stored in Google Chrome and I welcome my google overlord as such. View Designing and Developing for the Neurodivergent Mind on Notist. 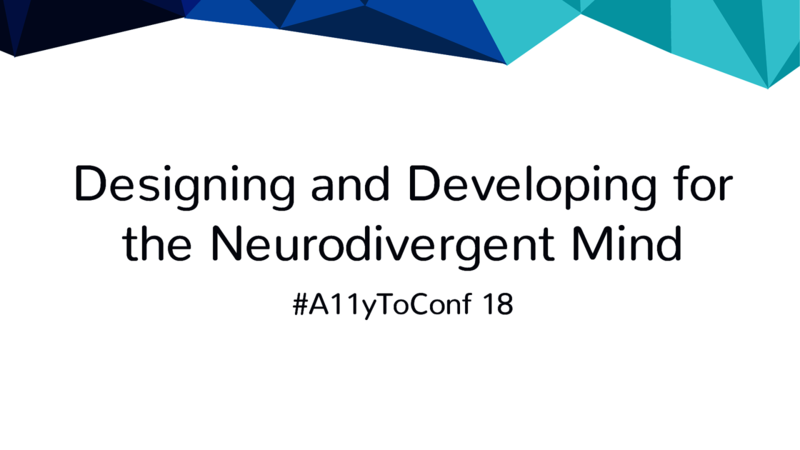 This presentation breaks down some of the stigma behind what it means to be Neurodivergent and the struggles experienced in an ableist society from the perspective of an Accessibility Specialist with ADHD. What Assistive Technology means to someone who is Neurodivergent will be covered in order to understand how easy it is to block someone from using the tools they need to complete daily tasks. Until we understand the experiences of people with Cognitive Disabilities we will continue to make design and development decisions that create inaccessible digital spaces. Shell puts presentations on for free. You can too.